Transportation Costs > How Much Does an Emission Test Cost? How Much Does an Emission Test Cost? An emission test is a procedure where a vehicle is subjected to a series of test that will determine if the smog released by a vehicle meets the city standards. This is necessary to make sure the air does not get polluted. This is one of the government’s initiatives to clean the air, and those who fail the test won’t be able to get their car registered with the state. Emission testing is done before a vehicle is registered or if it is necessary for other reasons. The procedure will be done in emission testing center and it can cost differently depending on the state you live in. Not all states in the United States require this testing. On average, the cost to have an emission test done is going to vary anywhere from $10 to $30. 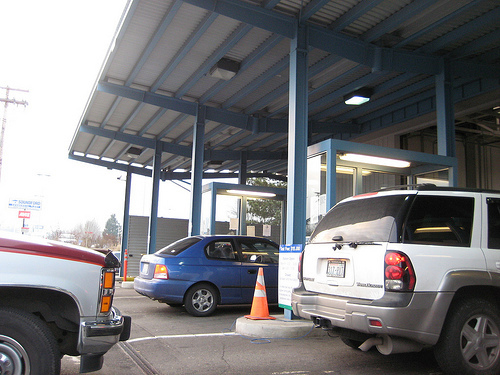 For example, in the state of Washington, you can visit Washington Vehicle Emission Check Program as they provide emission testing centers in five counties. The price, according to the state’s official website, can range anywhere from $15 to $20. In the state of Connecticut, it can cost $20 to $25. If you are in Colorado, it can cost anywhere from $15 to $25. Alaska The fee varies by county, type of vehicle and type of fuel. NOTE: Always check with your state’s official website as these terms can change. During the test, an inspector will use a computer to make sure that your car is up to par with emission standards. The test will examine the catalytic converter, the exhaust, and evaporative emissions. The test should take no longer than 20 minutes. Also, during the test, the inspector will also look for any sort of error code the computer may show. If any errors are noted, the car will fail the test and all problems will have to be fixed. If your car were to fail the test, then you would have to bring it back once the problems are resolved. This test, depending on the state’s policy, can cost as much as the original test. Some states, for example, will waive the fee as long as you bring it back within a certain duration, which is usually 30 to 60 days. If your car fails the test more than once, a professional mechanic will have to fix the car to bring the car up to a “passing” standard. Typically, these problems can range anywhere from a faulty o2 sensor to an older catalytic converter. The costs of repairs will depend on what needs to be fixed. All states will have its own requirements in regards to which cars need to be tested. For example, in Arizona, a car that’s a 1968 model or older will have to be tested. In Nevada, the car must a 1975 or older. Emission tests must be done at a verified location. To find an authorized emission testing location, a simple search, such as “emissions testing locations, plus the location you live in,” should yield results.